As a mother of a baby girl who had a UTI at 5 months old, I think it would be great to see some information on your site regarding UTIs. Our daughter had her first UTI at 5 months old. Leading up to the diagnosis, the only symptom had been an impressively high fever (104.6F). After hours of trying to control the fever with Tylenol, we made our way to the ER. At the ER, the doctor ruled out the possibility of an ear infection or cold. Since UTI was next on the list, a catheter was ordered. Watching your 5 month old get a catheter put in is so heart wrenching. Especially when she's screaming and crying. It took 4 different nurses and 5+ different attempts before they got it in. The longer it took the more and more I was starting to break inside. About 15 minutes later the doctor came back in and said the urine results confirmed a UTI. She was placed on antibiotics and we were sent home with instructions to follow up with our pediatrician. 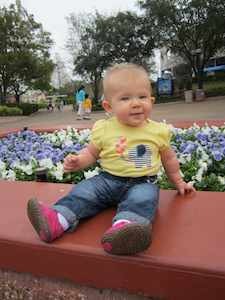 Following this experience, our daughter has a renal ultrasound and VCUG performed. The VCUG lead to a diagnosis of Grade I and Grade II VUR. An infection of the bladder or kidneys is commonly referred to as a urinary tract infection or UTI. While most UTIs occur in adult women, children get these infections too. Symptoms of UTIs can be fever, fussiness, pain with urination, increased urinary frequency, tummy ache, back pain or foul smelling urine. Often the only presenting sign in young children is fever. The majority of UTIs occur in girls when stool ends up in the vaginal area. This can happen with explosive diarrhea or improper wiping. It is important to wipe girls from “front to back”. Boy rarely get UTIs. In males, UTIs are more common during the first year of life and when uncircumcised. UTIs frequently occur during potty training when children are learning to hold in their urine. Urinary tract infections are important to identify early because they can worsen given time. There are many different ways to collect a urine specimen. The best method of collection is a “clean catch” where the individual urinates in a clean container. When done properly, this method is painless and yields an uncontaminated specimen. When children are not potty trained, there are two other commonly used collection methods. A “bag” urine specimen is obtained by placing a self adhering plastic bag in the diaper area. Bag urines are often contaminated by skin bacteria as the urine often washes against the skin during collection. I recommend bag urines when the patient is non-toxic and I believe the likelihood of a UTI is low. If the bag urine specimen appears to be infected, I will frequently recommend a bladder catherization to obtain an uncontaminated sample. To obtain a clean specimen, we often catherize an individual. A sterile plastic tube is inserted up the urethra and into the bladder. Practically, I recommend bladder “caths” when the patient seems “sicker” or the likehood of a UTI is high. Urine “caths” work well, but cause the patient discomfort during the procedure. There are two common laboratory methods to test urine samples. 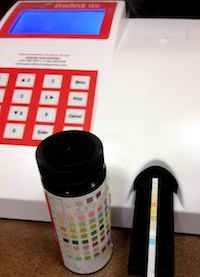 The most commonly used test is urinalysis. A urinalysis takes less than 5 minutes, but can only give an indication if the patient has an urinary tract infection. The picture to the left shows our office urinalysis machine. The gold standard test is urine culture. Urine is streaked on an agar plate and kept in an incubator for 24 to 48 hours. Practically, we use the patient’s history, physical exam and urinalysis to make the initial decision to initiate antibiotics. However, it is the urine culture that definitively determines if the child has a urinary tract infection. In pediatrics, children diagnosed with UTI frequently need further medical work up. Culture results are critical to determine the need for further medical procedures. Sadly, many clinicians in urgent care settings fail to order cultures as they are only concerned about the patient’s immediate, medical management. Urine cultures are the key to proper long term management. 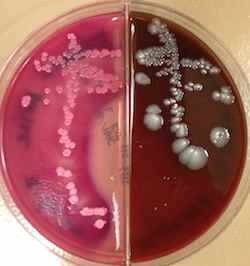 Urine cultures can then be used to determine the infectious organism. The major cause of urinary tract infections is E coli. Shown in the culture here. E coli and most other bacterial causes of UTIs are normally found in the stool. Viruses are rare causes of UTIs. Drinking excess fluids is helpful in treating UTIs as urinating can decrease the total bacterial load. Cranberry juice is able to change the pH inside the bladder and make it more difficult for bacteria to grow. There are a variety of oral antibiotics used to treat most UTIs. Classically, sulfa drugs (Bactrim or Septra) are first line. Severe infections that involve the kidneys and UTIs in infants usually require hospitalization for IV antibiotics. Often children are in such pain from a UTI that they are “unable to pee”. This quickly worsens as an individual bladder fills up. If this happens try giving your child a bath and asking them to pee in the warm water. The warm water seems to help them relax and finally urinate. For most cases of uncomplicated urinary tract infection which responds to therapy no further investigation is needed. When an individual’s urinary tract infection is complicated two radiologic studies are indicated. A renal ultrasound is used to evaluate a the anatomy of an individuals urinary tract. This is a painless study much like the ultrasound of a baby inside a pregnant mother. The second test is a VCUG or voiding cystourethrogram. VCUGs are ordered to evaluated the function of an individuals urinary tract. During a VCUG, a catheter is inserted into a patient’s bladder. Then a dye is inserted through the catheter to fill up the bladder. When the bladder is full the child urinates. During urination multiple x-rays are taken to examine how the dye flows. Normally, the dye (and urine) should be urinated directly out of the bladder. Occasionally, the dye will travel backward from the bladder toward the kidneys. When this occurs the individual has kidney “reflux” or more precisely vesicoureteral reflux (VUR). Vesicoureteral reflux can be graded on a scale of 1 (mild) to 5 (severe).